...that there is a flagpole in Aqaba that is visible from four countries? Me neither. 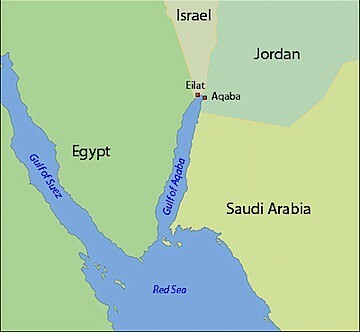 It was also news to me that Egypt, Israel, Jordan and Saudi Arabia all share a few kilometers of coast line at the top of the Red Sea in the Gulf of Aqaba. Well, not share in a friendly, 'what’s yours is mine’ kind of way, rather in a 'I’m watching you with all the military-strength listening equipment I have at my disposal' kind of way, but share they do. From the beach at Aqaba it’s possible to see the radar-spiked hills of Egypt opposite and the holiday apartment blocks of Eilat to the North equally well, and if this was a sane place, Aqaba and Elita would by now be almost one city, being located right next to each other. Here, as all along the King’s Highway towards Amman, Israel and the West Bank are visible in the distance across the misty waters of the Dead Sea. From looking at a Middle East Map these feuding countries always looked so big and separate from each other, but in reality there are no geographical dividers, enemies are cheek by jowl here. If there was co-operation, what great things could be achieved!